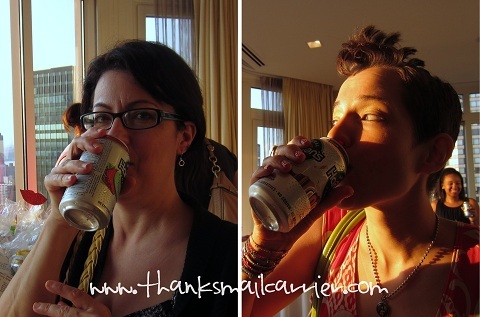 As BlogHer tends to be a whirlwind every year, it didn't surprise me that 2012 wasn't any different. 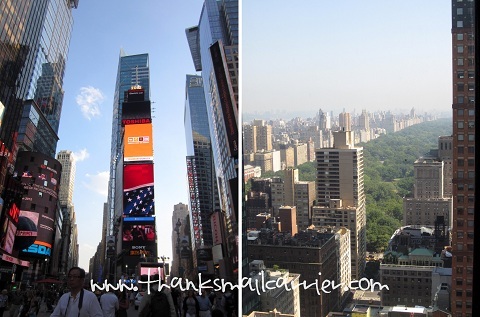 In fact, the five days that I spent in New York City somehow seemed an even more chaotic jumble of activities, speakers, parties, cabs, walks, outfits and delayed flights home than usual. ...is it really any wonder that, after going, going, going from early morning to late at night, I feel as though I might need to sleep for the next few weeks to fully recover? 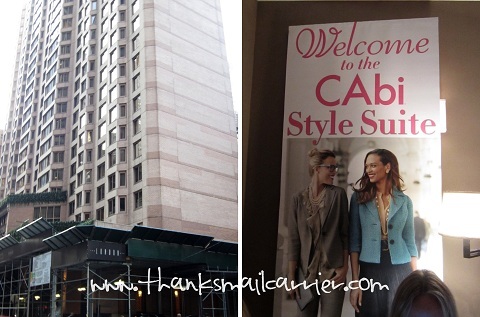 With that said, out of all of the fun events that I attended this year, one of my top few favorites was the third annual Style Suite, hosted by Savvy Sassy Moms and Momtrends. Aside from being extremely stylish themselves, Andrea and Nicole know how to put together an amazing party! 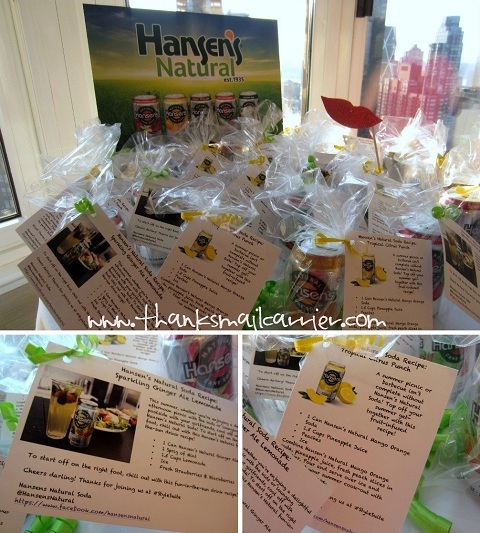 While I was looking forward to seeing the gorgeous CAbi Clothing and the Stokke baby products represented, I was also excited about the opportunity to sample and learn more about a third sponsor: Hansen's Natural Soda. Known for saying goodbye to high fructose corn syrup and hello to real cane sugar, Hansen's Natural Sodas have always been free of preservatives, caffeine, sodium, artificial flavors and colors. After hearing that there are 30 real fruit and spice soda flavors of Hansen's Natural and Diet Sodas, I couldn't wait to give one a try (as well as see the reaction of others) at Style Suite. ...but stepping into a beautifully decorated room and finding Hansen's was the perfect accompaniment to the breathtaking view. ...there were plenty of Hansen's samples to go around. The hardest decision was figuring out which flavor to try! 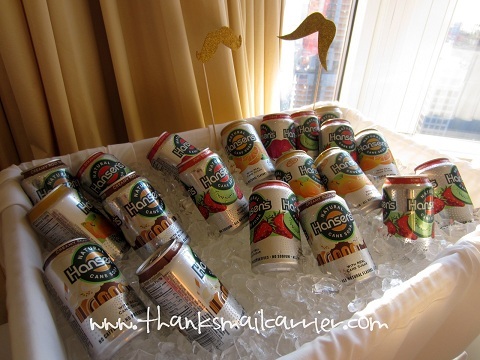 ...and, along with the great tasting flavors of Hansen's on their own, I loved that they offered unique and inventive recipe ideas to turn a can of soda into Sparkling Ginger Ale Lemonade, Tropical Citrus Punch and more! Talk about perfect for a party! 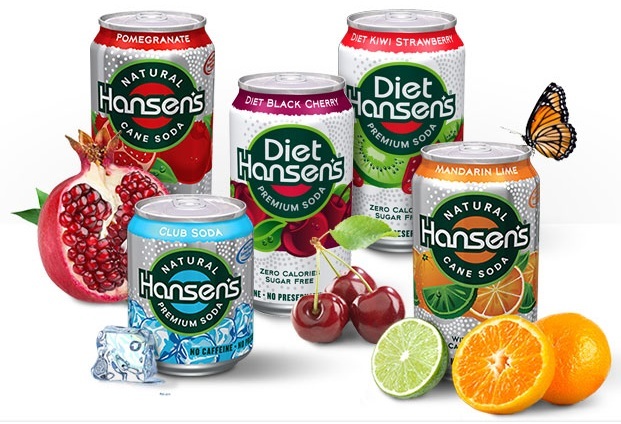 With options (regular and diet) including Cola, Mandarin Lime, Creamy Root Beer, Kiwi Strawberry, Pomegranate and many more, Hansen's Natural Soda has the exotic, spicy, tangy, tart or sweet flavor that your whole family is sure to love. Considering that it is free of all of the preservatives, caffeine, sodium and high fructose corn syrup that traditional sodas include, there is no reason to not crack open a tasty can of Hansen's instead! One lucky person will win a case of Hansen's Soda! I received compensation and product from Hansen's for my time as a Hansen's Social Media #StyleSuite Correspondent. A big thank you to Hansen's for also providing a case of soda for one lucky giveaway winner. The opinions shared are my own and honest and if you really need to see more, click here to see how I roll. I would want to try their original cola first, but then I would want to try the mandarin lime and the pomegranate. I think I would really like the black cherry. I like the Diet Black Cherry. I would like to try the Diet Pomegranate. I would try Cherry Vanilla Creme first. I would like the creamy root beer. I think that I would like to try the Diet Pomagranate first. I'd love to try their ginger ale! I'd like to try the creamy root beer. I think Pomegranate sounds great! I love Hansen's Diet Black Cherry, amazing flavor! I love their Kiwi Strawberry! Yum! My favorite Hansen's sodas are Mango Orange and Kiwi Strawberry. I would love to try their ginger ale! I would really like to try their Diet Tangerine Lime! I'd first like to try mandarin lime. Thanks. The Diet Cherry Vanilla Creme sounds delicious! the Diet Creamy Root Beer & Diet Cherry Vanilla Creme sound awesome! I think the Cherry Vanilla would be fun to try! I would love to try the club soda. That is great you have the opportunity to be involved with the blog festivities,nice work. i want to try the Grapefruit! I would love to try Mandarin Lime. I'm logged into rafflecopter as Patrice. I would love to try the Cherry Vanilla Creme! The California Pomegranate sounds delicious! creamy rootbeer and then the mandarin lime! i would love to try their mandrian lime...sounds like a tasty combo! I'd like to try the Pomegranate. My favorite is Mandarin Lime. I'd like to try the one called The Grove. I would like to try Diet Black Cherry! The pomegranate and cherry vanilla sound great! I would like to try the Diet Creamy Root Beer and the Diet Pomegranate. I'd like to try Kiwi Strawberry. I would like to try the Diet Black Cherry. I love cherry-flavored colas. I want to try Key Lime and also Pomegranate! I would love to try the Mandarin Lime. the vanilla cola sounds so good! I would love to try the Black Cherry. My favorite is the Diet Hansen's Diet Creamy Root Beer. Creamy Root Beer and Cherry Vanilla Cream are my Favs!! I would like to try the cherry vanilla creme or the kiwi strawberry. I'd like to try any of the diet flavors, but especially the diet cherry vanilla! Mandarine Lime sounds sooo good. I'd like to try the pomegranate one. I want to try the Mandarin Lime. I'd like to try the Key Lime twist first. Cherry Vanilla Creme sounds yummy! I want to try the Creamy Root Beer. I'd try the Creamy Root Beer first. First I'd try the Key Lime Twist flavor because I love almost anything citrusy. My fave flavor is Key Lime Twist. Thanks. I would like to try the Cherry Vanilla Creme. I'd like to try the mandarin lime. I'd like to try mandarin lime. The Mandarin Lime would be my first choice. I'd most like to try the Kiwi Strawberry! I would love to try the Cherry Vanilla Creme. I would love to try the Creamy Root Beer. My mouth is watering just thinking about it. I'd like to try Diet Pomegranate :) *Thanks* for the giveaway! Cream Soda is my Favorite so I would want to try that first! I would love to try the Mango Orange first or the Grapefruit flavor. I'd love to try the cherry vanilla cream. I would like to try the Pomegranate flavor. My fav is their root beer. I'd love to try the Mandarin Lime! I didn't have to look! (though I clicked anyway). We love the Mandarin Lime. I'd like to try the Cherry Vanilla Creme. Mango Orange would probably be my fav. I want to try Cherry Vanilla Creme! I want to try the Diet Black Cherry. I love their Mandarin Lime flavor. I would really like the black cherry. As a teen, I spent almost my whole allowance on rootbeer, so the Creamy Rootbeer is my pick! i would like to try the mandarine lime soda!! I like pretty much everything they make. Diet Pomegranate would be my first choice! 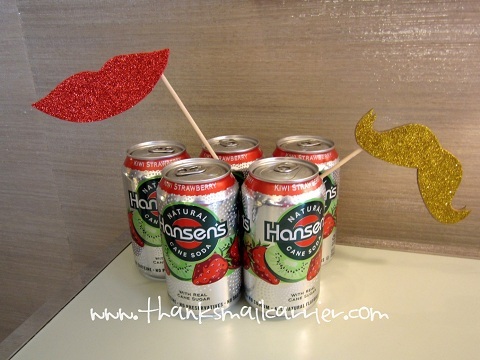 I have known about hansens for years ..good stuff would really like the vanilla soda or cherry.. I want to try their root beer. Kiwi Strawberry would be my Hansen's of choice! I would like to try Creamy Root Beer. I would like to try the Pomegranate flavor. Thank you! I'd like to try grapefruit. Thanks for the giveaway. The Black Cherry sounds yummy! I would love to try the Key Lime Twist.